I had my first experience with a Phicen Super-Flexible Seamless body back in the winter of 2015. 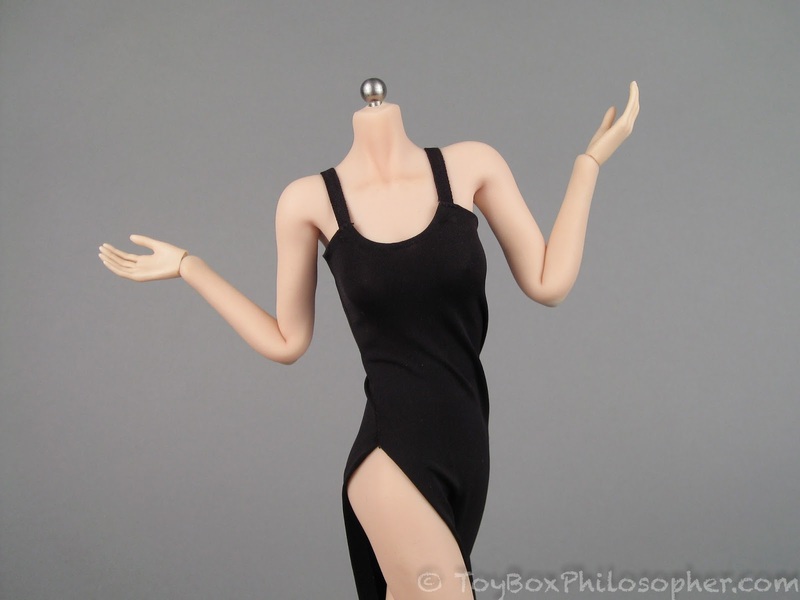 Ever since my review of that doll (Leila, a stainless steel S01 figure) I've been considering another Phicen purchase. In fact, I bought another doll while I was reviewing Leila, but I sent her back immediately because I did not like the body shading or the head sculpt. I always assumed I'd give the brand another try, but there have been some obstacles along the way. The first obstacle was that my older Phicen body is not holding up very well. I was never able to get the pencil stains off her leg, and her soft body has continued to separate along the side seams. Another hurdle is that the newer Phicen bodies do not come with heads...and Phicen doesn't sell heads separately. In theory, I was happy to purchase a head from a different company, but it's not so easy to tell which heads will go with which bodies, and the Phicen pale bodies seem particularly difficult to match. My mission for this review was to order a new stainless steel pale body and then find it a head. Sounds simple, right? However, I'm not very good at keeping track of all the different types of Phicen body (or all of the different brands of heads, for that matter). My inexperience led to a few blunders that took me off on some unexpected tangents. By the time I figured out what was going on, I had way too many photographs for one post. I decided to split my discoveries into several short parts: Part 1 will be my quest for a decent head for an S01A body. Part 2 will feature a Phicen male body (and the selection of his head), and then Part 3 will look at two of Phicen's 6th generation female bodies...and a few more heads. It's going to be a full-blown Phicen overload. Phicen S01A body with middle-sized breast...and no head ($74.99). Whoa. What a wintry week we're having here in Maine! Thursday was the second snow day in a row for the local kids, and we're looking at another two feet of snow for tonight. I'm hoping to get this review posted before that storm hits! So far we've been fortunate enough to keep power (and avoid any more branches through the roof) so it's been an excellent time for me to work on my next several reviews. I'm really excited about all of the dolls that I have planned for the upcoming month...I just hope I can work as fast as my mind is racing! This particular review has been a long time coming. I pre-ordered Monster High's Zomby Gaga back in October (after Dmitry's excellent suggestion). 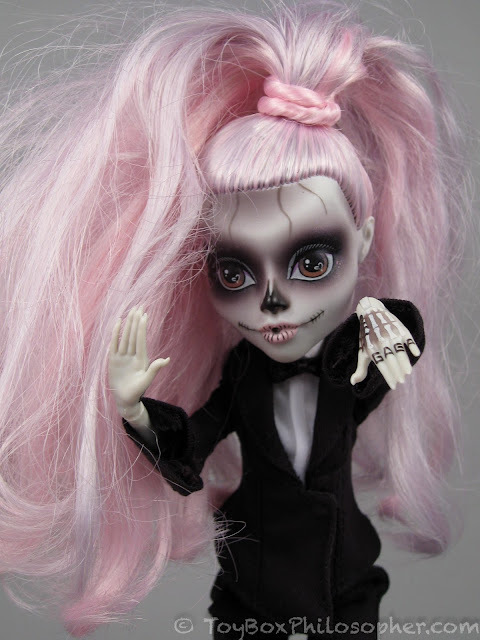 Zomby Gaga is a special edition doll meant to depict Lady Gaga from her Born This Way music video. Zomby Gaga arrived in early January, but I've had a hard time tracking down the other doll I needed for this review--Robert Tonner's Zombie Boy. Zombie Boy is the screen name of Rick Genest, the tattooed model who appears alongside Lady Gaga in her video. I finally found the Zombie Boy doll safely tucked away on a back shelf. He's fragile, and so I don't keep him on display. The timing actually worked out really well, though, because the real Lady Gaga performed at the epic Super Bowl game last weekend, and so I've had her songs going through my head all week. "Zomby Gaga" by Monster High, $23.99. Sunday Surprise: Twozies and Sonny Angel! Whew. I was so emotionally bogged down by that Global Girl review (I dislike writing negative reviews...), I needed to do something fun immediately! So--I have a quick (Super Bowl) Sunday Surprise post for you! This post happened out of the blue because of a lucky coincidence. I've been eyeing the Twozies surprise packs in the store for a while now, even purchasing one on a few different occasions with the idea that I'd add them to a Sunday Surprise post one day. Then, last week, as I was checking Amazon for the availability of L.O.L Surprise dolls (they're still so hard to find around here! ), a new kind of doll popped into my suggestions list: Sonny Angel figures by Dreams Inc. I'd never seen these little cuties before...and they remind me a lot of the Twozies. Sonny Angel (left) and Twozies (right) blind box figures. I've been doing a lot of organizing and cleaning in preparation for the upcoming repair of my studio ceiling. All of this work has unearthed several dolls that I honestly forgot I owned. 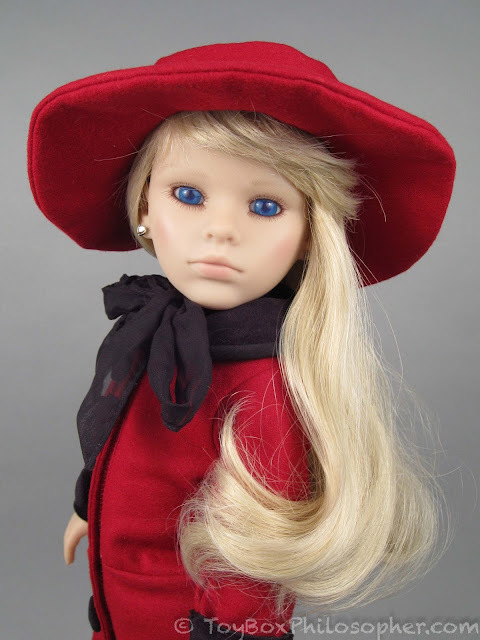 For example, I purchased the doll I'm reviewing today--Vivienne by Global Girl--back in the fall of 2014. At that time I was exploring many different kinds of 18-21 inch play dolls, and the Global Girl company was suggested to me as an interesting new addition to the market. The company's mission is to use dolls and books to expose kids to different cultures and countries around the world. This is definitely the kind of mission I appreciate. I also like to support new doll companies, and so I happily purchased Vivienne, Global Girl's character from France. So why didn't I review this doll when I first got her? Well, first of all, I didn't have a great ordering experience with the company. I'll assume they've improved their customer service over the last few years and leave it at that. But, more importantly, when Vivienne arrived, I immediately took her out of the box to inspect her face...and discovered that she had terrible staining all around her neck from her dark scarf. So, I popped her back into her box and pondered what to do next. As a general rule, I don't like to review dolls that I know I'll dislike, especially when I'm dealing with a small start-up company. So, I tucked Vivienne away in a corner and procrastinated over the review...for two and a half years. "Vivienne" by Global Girl, $89.99.